New cars have never been safer after a raft of freshly launched models achieve full marks in Euro NCAP’s crash tests. 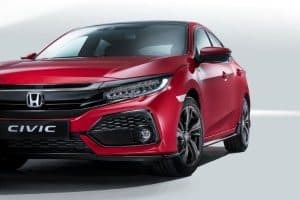 The Honda Civic’s five-star safety rating will boost its fleet credentials after it was retested by Euro NCAP following improvements to the rear seat restraint. Other models picking up all five stars included the Mercedes-Benz X-Class luxury pick-up, the Jaguar E-Pace SUV, Porsche Cayenne, BMW X3, DS 7 Crossback and two Subarus: the XV and Impreza. Michiel van Ratingen, secretary general of Euro NCAP, said the safety assessment body’s strict test criteria meant it was tougher than ever for a car to obtain full marks. Mr van Ratingen added that it was a positive sign that manufacturers still strive to achieve a five-star rating for their new products. Responding to the E-Pace’s maximum rating, Jaguar Land Rover’s director of group engineering Nick Rogers explained why safety is one of the car maker’s core customer principles. “The E-Pace will bring new customers to the Jaguar brand, particularly young families, so safety is an absolute priority and clearly, we’ve delivered here,” he commented. In 2018, Euro NCAP will tighten its test criteria yet again, introducing assessments for self-braking systems that can detect cyclists and pedestrians, automatically applying the brakes to avoid a collision. Most new cars offer an autonomous braking system as an option, if not as standard, and that is expected to increasingly become the norm throughout 2018 and beyond. Mr van Ratingen went on to state that it is Euro NCAP’s mission to help consumers understand how these new systems work, to show what they are capable of and to explain how they can save lives.